Oh why did I buy all that variegated yarn!? If you're like me, you probably have way more variegated yarn that you need. They just look so nice on the shelf! 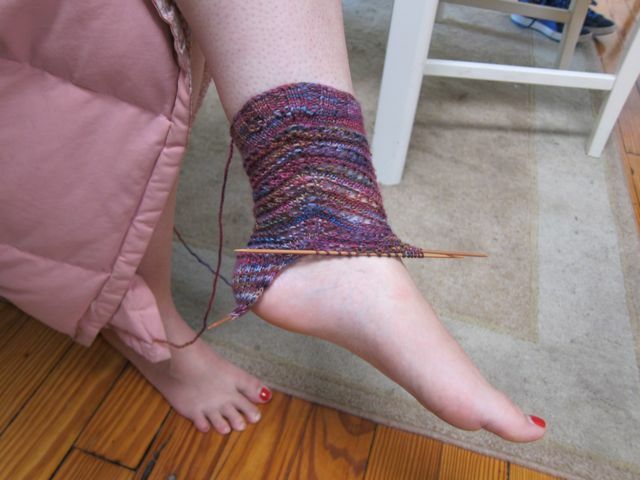 But, when knit up, variegated or multicolored yarns are prone to obscuring complex patterning. Try using a pattern with short rows and/or simple horizontal textures. My Silk Ruffle Scarf is a great example. 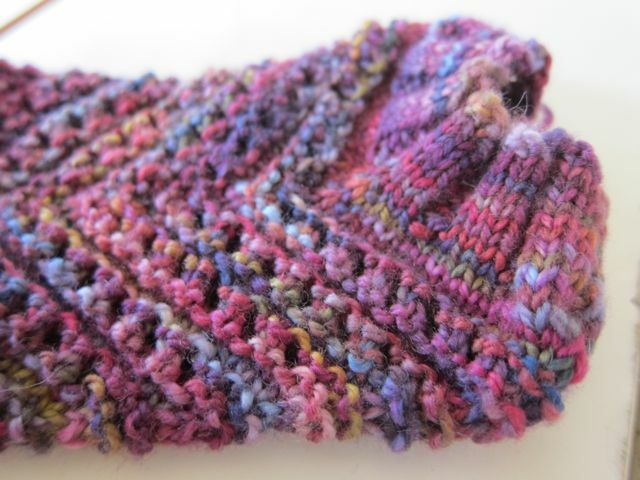 The short-rows make more fun to knit and cooler looking, while the use of garter stitch, the most basic of all stitches, allows the yarn to be the center of focus. Also, I find that the use of texture eliminates the bad kind of pooling from my knitting, simply because it makes it less noticeable. 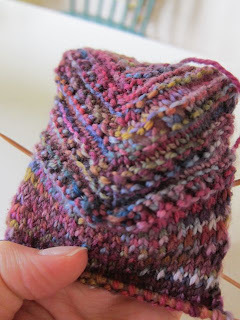 This week I've been working on a pair of socks in some Cherry Tree Hill Super Sock Potluck Yarn. I really liked Emily B. Miller's Crosswalker socks, but the yarn I wanted to use is more patchy than stripy so I designed a mitered sock with a simple eyelet pattern between rows of purl stitches. I find that adding the purl rows shows off the true variety of color in this yarn. Here are some pics. Pattern to follow in a few weeks.